This is our first blog entry so we’ll start by just giving an into as to who we are, where we are, and what we have to offer. 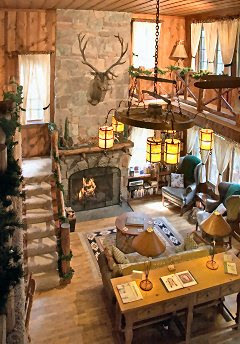 Rocky Mountain Lodge & Cabins is a Colorado Bed and Breakfast Lodge & Cabin rentals in Cascade, Colorado, at Pikes Peak. Where’s Cascade, you wonder? Cascade is a small mountain community at 7,500 feet elevation in the Ute Pass of the Rocky Mountains. We are IN the mountains with beautiful views just 6 miles west of Colorado Springs, 5 miles west of Manitou Springs, 6 miles east of Woodland Park, and 58 miles south/west of Denver. We, and our guests, LOVE our location because we’re “away from it all IN the mountains”, yet “close enough” to the cities and area attractions. Our Colorado Lodge operates 2 different ways, either as a Bed & Breakfast Inn where you can rent an individual room and enjoy our signature 3-course breakfast each morning; or as a Lodge Rental where you can rent the Lodge in it’s entirety for family reunions, weddings, or retreats. The Lodge is perfect for a Colorado honeymoon, romantic getaway, anniversary, or Colorado vacation. The Lodge has 6 bedrooms, each with a private bathroom and Cable TV/VCR player. Some have their own private balcony, fireplace, or jetted tub for two. And check out our romantic honeymoon suite, the Cascade Suite. The 2 room suite is our most popular room, and guests staying in our Cascade Suite have our gourmet breakfast served to them in-suite! the modern conveniences that we’ve all become accustomed to, yet with all the original charm. It has a living room with a fireplace, Cable TV/DVD player, and queen sized sofa bed. It has 2 bedrooms; the master bedroom with a queen bed, and the 2nd bedroom with a bunk bed set up with a double futon on the bottom and a twin on top. It has 1 bathroom with a jetted tub and shower. And a fully stocked and equipped kitchen (minus the food). The cabin also has a private outdoor patio with a BBQ and your own private hot tub, and has beautiful mountain views. Linens and towels are included. Wireless Internet also available at no additional charge. The Cabin will sleep up to 7 people. Our quaint Colorado vacation Cottage, build in 1938 of stone and wood, is charming! It has 2 stories. Downstairs has one open room with a kitchenette, dining area, day bed that opens to 2 twin beds, and the bathroom with a shower. 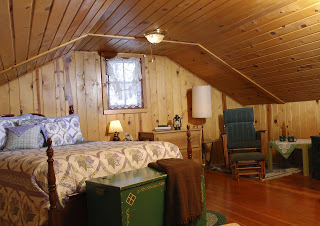 Upstairs is one open room with a queen bed, double futon, fireplace and Cable TV/DVD player. Wireless Internet is also available in the cottage. The Cottage will sleep up to 6 people. We are located in within a short drive to most of the attractions in the Pikes Peak Region. Colorado Springs and the Pikes Peak region are famous for the many outdoor activities and is a hot spot for outdoor enthusiasts, families and vacationers. Pikes Peak, for example, is the 14,110 mountain where the song “America the Beautiful” was inspired. You can take the cog train to the top, drive up to the top (don’t be intimidated that there’s no guardrails, you can always purchase a T-shirt at the top that says “Real Men Don’t Need Guardrails”), or even hike up to the top. Some of the other area attractions are Garden of the Gods (red rock formations), Cave of the Winds, Manitou Cliff Dwellings, the US Air Force Academy, Focus on the Family, Mollie Kathleen Gold Mine, Seven Falls, the Cheyenne Mountain Zoo, museums, and much more. There is also a wealth of activities to partake in such as whitewater rafting, horseback riding, golfing, jeep tours, hot air balloon flights, mountain biking, hiking, shopping, dining, and more. We also offer a variety of packages to take advantage of the most popular attractions in the area, as well as Romance packages to help with that special honeymoon, anniversary, or romantic occasion. Rocky Mountain Lodge & Cabins is a fantastic place for a family reunion location, small, intimate Rocky Mountain wedding, or scrapbooking retreat. We can host up to 40 people for group events. Rocky Mountain Lodge & Cabins was voted “Best to Visit Again & Again, Best with Nearby Attractions, and Best for a Honeymoon and Anniversary” by Arrington’s Inn Traveler Book of Lists for 3 years in a row! And most recently received the “Guest Favorite Award” from BnBFinder.com. Have we wetted your appetite for a Rocky Mountain getaway yet? 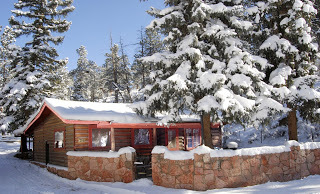 Visit our website at http://www.rockymountainlodge.com/ and find out more about our facilities. And if you’ve been a guest with us, please feel free to share your experience with others by posting your comments. We’d love to have you back, and look forward to meeting our new guests! This entry was posted in Uncategorized and tagged Colorado Vacation Rentals, Things to do in the Pikes Peak Region by Debbie Reynolds. Bookmark the permalink.